I started reading I Declare 31 Promises to Speak Over Your Life by Joel Osteen and have found it to be an enjoyable read. From Day 1 up to Day 13, I have found it to be a tremendous source of encouragement, inspiration, and motivation that helps me remain focused on my targeted priorities for this season of my life. I read Day 13 today and felt inspired to post what inspired me as I read it. Day 13 is significant to me, because change and I have not always been acquainted with one another in a manner I was comfortable with. Believe it or not, recent revelation allowed me to see that it was something I still wrestle with and from that I understood, in 2014, I needed a fresh perspective of what I understand change to be. It didn’t hurt to hear the still, small voice of my Savior speak to me about Him being the author of change, from the perspective of the salvation experience alone, being a process of change, or transformation. Receiving this recently was the process by which the fresh perspective of change would be ushered in. Reflection allows me to see how I began the attitude of resistance to change and was continuing to react habitually in the same manner as an adult in the way I did as a child. God truly does make all thing new! What I like about the declaration of Day 13 is how it speaks to me about coping with change by reframing how I see ‘change.’ What came to mind as I read and reflected on the declaration was how easy it is to accept change when God’s favor is involved in bringing something positive that brings about transformation, prosperity, or fulfillment. Time and maturity in my faith walk with God has challenged me to look beyond the reality of the condition of my current circumstances and trust and believe He is faithful to make this change well worth the encounter regardless of the experience associated with it. I am now persuaded that He does work everything together for good. You read it, it’s written in the Bible, and you hear it preached, but it must be believed, embraced, in order to be encountered. When those footprints in the sand seem to go on forever with only one set of prints and your focus consistently is on what was left behind not engaged in the moment of being carried by your Savior, change is hard to see and embrace as something working together for good. Like the disciples who were instructed to get in the boat and sail across the Sea of Galilee, I am now on the other side of my desire to get to the better place and it took a tremendous amount of change to get me to where I stand now! I have since learned that acceptance is the means by which I learn to change and embrace the fresh perspective that allows me to see ‘change’ in the way God desires me to so I can see Him perform the miraculous and the impossible beginning with what He does within me! May God bless you and help you to cope with the changes and transitions you encounter with faith, hope, acceptance, and love so you may experience the fullness of life Christ came for us to have. ‘I am the man who has seen affliction by the rod of his wrath. During the process of writing this book, I discovered that darkness should not be feared but should be embraced, or accepted, as a means of overcoming fear. The things about and within me that taunt me, trouble me, and torment me must be mastered, if I am to experience by faith the fullness of life that Christ came to give me and declared that I should have. In order for me to master something, I must be willing to face it until I conquer it. “Who shall separate us from the love of Christ? Shall trouble or hardship or persecution or famine or nakedness or danger or sword? As it is written: ‘For your sake we face death all day long; we are considered as sheep to be slaughtered.’ No, in all these things we are more than conquerors through him who loved us” (Romans 8:35–37 NIV). In the New Testament book of Romans, the apostle Paul declared the principle of mastery (“more than a conqueror”) as an act accomplished through God,who loves us. During the days of Adam and Eve, God addressed the principle of mastery over sin with Cain. But Cain rejected God’s admonition and murdered his brother Abel out of envy and jealousy. “Then the LORD said to Cain, ‘Why are you angry? Why is your face downcast? If you do what is right, will you not be accepted? But if you do not do what is right, sin is crouching at your door; it desires to have you, but you must master it’” (Genesis 4:6–8 NIV). Scripture is not specific as to why God favored Abel’s offering over Cain’s. What is evident is Cain’s reaction to not experiencing God’s favor. God mentioned in scripture that Cain was angry and his face was downcast, depressed, or grieved. God acknowledged that Cain needed to do right in order to be accepted. Cain was disobedient, but he was still seeking God in some way, desiring and anticipating God’s favor. However, Cain was consumed by the darkness of his emotions, and he disregarded God’s warning, which ultimately led to Abel’s murder. Cain did not heed the light of God’s instruction to master the darkness within him, which greatly influenced his actions and behavior. This led to Cain’s isolation as a wanderer. Cain, consumed by his pride and emotions, never acknowledged the murder of his brother or expressed remorse to God for his actions, even when God confronted him about his conduct. In fact, the only complaint Cain rendered was to express his displeasure with God over the severity of the consequences for his sin. He felt that he was being treated unfairly. The darkness in Cain’s world drove him to envy, jealousy, anger, depression, hatred, murder, dishonesty, indignation, and irreverence toward God. It also caused him to become isolated from God and a restless wanderer. But in spite of all the darkness that surrounded Cain, God provided His light of grace toward him by sparing his life and protecting him from his own fear of being murdered by others. God placed a mark of mercy and grace upon him that spared him from the fear of death and allowed him to experience life—even though his actions did not merit such favor from God. In the New Testament book of Matthew, Jesus Christ declared His Father in heaven to be the o causes the sun to rise on the evil and the good, which is what God did for Cain. Jesus Christ came into this world to spare us from a life of wandering aimlessly¾with no sense of God’s presence or sensitivity to Him¾and from being unproductive because of the curse of sin and the anguish, emptiness, and darkness that fills the soul. Through His Son, Jesus Christ, God warns us to receive His help to master our sin and to escape the consequence of sin and the fear of death. Through the intimate presence of His Holy Spirit within us, He provides us with a mark of grace and mercy that covers and protects us. God did these things out of love for us, so that we may experience a life with meaning, purpose, and fulfillment. These qualities enable us to overcome the darkness of this world and the world within us. Seeking to gain a better understanding of the subject of darkness led me to a review of scripture from both the Old and New Testaments. My study provided insight on the types of darkness we encounter in this world: natural darkness, spiritual darkness, and circumstantial darkness. I also found myself plunged into discovering my own personal darkness during this inquiry. This made for an extensive, more personal encounter with God, even as I learned about darkness. I learned more about what a personal faith walk with Christ entails. I experienced challenges that tried me and drove me to trust and rely on Him. All of this drew me closer to Him. The journey through my personal darkness led to the discovery of His unfailing love in a more intimate, personal way. It continually reassured me that He was with me in my troubles, protecting me and preserving my life. I learned about the necessity of sincere surrender to the will of God and believing that God will fulfill what He promises and perform what He speaks in the face of misfortune, adversity, and hardship. I am learning through the encounter with darkness that God is the great Light for me. He will help me navigate through the darkness of this world. The greatest discovery and fulfillment of life is to know Him and to encounter a personal walk with Him. May God bless you and help you to grow in the grace and truth of Christ so you may endure, persevere, and overcome the circumstantial and spiritual darkness you may encounter as you walk by faith. 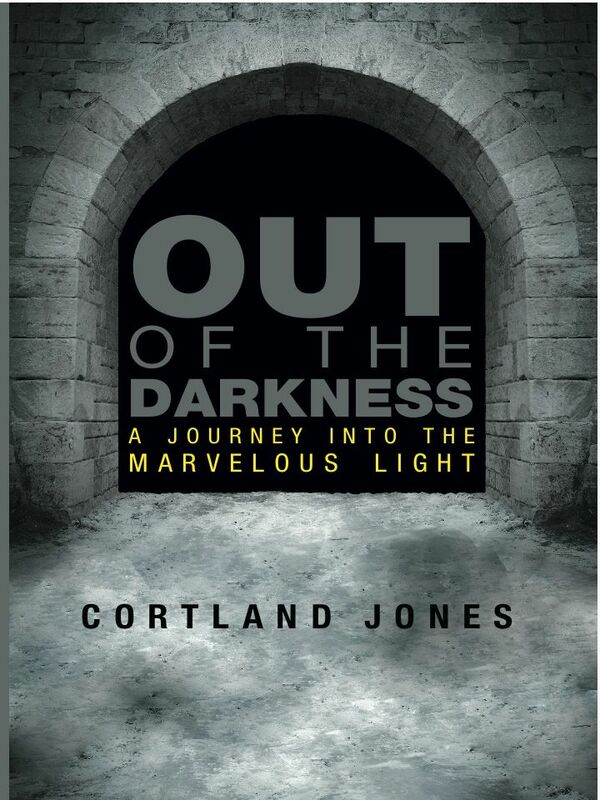 Purchase your copy of Out of the Darkness today from the link on this site! From my previous post Faith and Anger: Anger is One Letter away from Danger, I provide thoughts and insights I’ve learned on the subject of presenting the topic of anger and experiential knowledge from my own encounters of wrestling with the emotion anger. I shared this past weekend with my friend mentioned in my last post Faith & Appreciation in a Transition, I realized I was expressing my own anger about circumstances related to my transition without acknowledging the hurt. Her patient, persistent inquiry, ‘How are you doing,’ when we would talk and it allowed me to come to the realization and breakthrough i was saying I was angry, but not acknowledging the hurt. I consider her an angel sent from God to aid me in my recovery during my own transition. Anger masks other emotions. Most times I am not angry because I am angry. I am angry because I feel betrayed. I am angry because I feel misunderstood. I am angry because I feel neglected, violated, disappointed, threatened. Time and experience has taught me that I am better able to cope with and manage my moments of anger when I am successful in acknowledging why I feel the way I feel and what I feel. Journaling since 2003 and now blogging has enabled me to better identify the why and what of what I feel. I have also learned that I have not yet learned to cope with what I am encountering until I am able/willing to talk about it and that process is different for everyone, because the intensity of one’s grief determines how one chooses to cope. Have you ever felt a weight so difficult you didn’t even feel like praying about it. In the garden of Gethsemane, it is mentioned in Matthew, Mark, and Luke’s gospel accounts that the disciples were exhausted from sorrow and failed to watch and pray as Jesus admonished them. I believe my breakthrough was part the inquiry of a friend, journaling, prayer, time, and a soul’s yearning to get to the ‘better place,’ along with God’s grace (His word and His Spirit) sprinkled in for good measure to ensure I would get there! It also didn’t hurt to have the accountability of teaching on the subject as a consistent reminder to my inner being about my own soul’s progress through the process of grief. Anger may masquerade, but grace uncovers when a soul is open to healing, recovery, and resiliency. May God bless you and help you to unmask anger and identify the true feelings of grief associated with your transition to help you heal, recover, and encounter resiliency. Have you ever come out of a season of adversity, suffering, or challenging circumstances and did the proverbial ‘look back,‘ feeling a sense of appreciation thinking that what you encountered, had come out of, was worth it seeing the result working together for good despite how you felt while going through it? It happened to me recently, at the time my book was being published, I had this overwhelming sense of appreciation for having gone through what I had just endured seeing the result culminating in the book, but while going through it, I was feeling something entirely different. I actually said to myself it was all worth it, but that was not always how I felt in the process. I do not believe God wants us to be thankful for tragedy, suffering, and misfortune, but I do believe we can give thanks to God during and after what we encounter if we are able to maintain the proper perspective and posture while going through the storms of life and after they cease. Encountering separation and divorce brings with it, in some instances, so much uncertainty, instability, and anxiety that giving thanks would probably be the last thing some would think to do, or desire to do. Communicating with a friend today, there is the reality and the intensity of the grief associated with a transition that is and can be overwhelming that would make giving thanks an unbearable weight added to the process of moving forward. I have learned the value of acceptance and how it becomes the vehicle and means by which giving thanks can be actualized during the process of grief and the transition. May God bless you and help you to get to the better place where acceptance and appreciation allows you to endure, persevere, overcome, and prevail against the reality of the transition until your breakthrough comes. I am guilty of allowing the folly of giving full vent to my anger and being displayed as a foolish person. I don’t live in regret, but I have regretted being the foolish person who gave full vent to his anger. Thank God for Jesus Christ who covers my transgressions, forgives my sins, and does not count them against me. I have also demonstrated being the wise man who keeps himself under control in the face of distress and under the duress of injustice and the provoking behavior of others. In those moments all glory goes to God for the power of His Spirit at work in and through me that equips, enables, and empowers me with the fruit of patience and self-control. Anger is a very powerful emotion that brings with it a surge of adrenaline. Because the effects of anger (both internal and external); how it makes one feel and influences some to do, some may feel, or think, anger is an unhealthy emotion. Anger is simply an emotion, like sadness, happiness, fear, etc., but it can be expressed in an unhealthy manner when it is not managed appropriately. We usually experience anger from a sense of injustice, but without anger we would not be compelled to act against injustice. Anger, by itself, does not affect change. Just ask the parent who is angered daily by their adolescent child who consistently fails to clean up their room. The parent’s anger does not, by itself, influence the child to clean up. Being angry about something, alone, will not bring about the desired results we seek. When channeled properly, however, anger fuels us to action. The Civil Rights Movement of the late 1950’s-1960’s is an example of faith and anger in action. Anger out of control is anger that is left unmanaged. Much like a balloon when the air content reaches full capacity and the balloon is released, it flies all over the place. Anger out of control is like a balloon released with a full content of air. Take the same balloon filled to capacity and, instead of releasing it, you hold the end of it allowing air to be released intermittently until the balloon rests exempt of air. This is anger being managed, or anger under control. Anger Management is relearning the triggers and signals that occur when someone is becoming angry so they can then learn to better manage the emotion anger. Anger triggers are the internal/external forces that occur that can cause someone to become angry. Feeling tired, hungry, annoyed, a particular word, a pointed finger, someone lying on you, favoritism, being mistreated, etc. are all examples of anger triggers. Anger signals are the physiological reactions that occur within me that let me know I am becoming angry. Sweaty palms, increased heart rate, clenched fists, rolling the eyes, neck swiveling, cursing, yelling, calm voice, crying, etc. are all examples of anger signals. I cannot control someone trying to push my buttons (anger triggers), but I can learn to control my reaction by learning to identify the anger signals when they occur to move away from anger quicker and return to a normal state. By doing this I consistently learn to detect, defuse, and deal with my anger and my circumstances in a manner that allows me to be victorious, free, and in control of self. This provides me clarity, wisdom, and the necessary resolve to face the challenges that provoke anger in order to overcome and prevail against it. May God bless you and help you to respond to your anger signals and manage your anger in a manner that allows you consistently to be free, prosperous, and productive. From this point, moving forward and looking ahead, what would the ‘better place’ look like for you if you are currently in a place you no longer desire to be? Rejoice in suffering- learn to accept and see the value of the tests, trials, and misfortune God allows, and uses, to conform us into the image of Christ. Though some circumstances are intensely painful to encounter, faith in Christ and the hope of the glory of God says everything will work together for good because sharing in the sufferings of Christ positions me for the encounter of sharing in the power of His resurrection! The posture of humility and the position of reverence remaining confident God is and will reward those who diligently seek Him is what allows the encounter of the ‘better place.’ Believe in the hope of the glory of God to be revealed in your transition to the ‘better place’ and watch God position you for the impossible and the miraculous! May God bless you and help you to rejoice in Him and remain confident in Him despite the condition of your current circumstances so you may encounter the impossible and the miraculous.